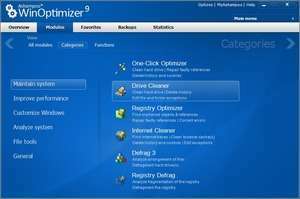 WinOptimizer Platinum by Ashampoo is a complete and comprehensive set of utilities which keeps your Windows PC in top operating condition. The program is organized into six different groups where different tools are. The groups consist of tools for cleaning the PC, for improving performance, privacy tools, security tools and tools which allow users to customize their Operating System. Ashampoo WinOptimizer comes with 20 different modules; you can use them to defragment hard drives, optimize the Windows registry, analyze space taken up on different drives, recover deleted files and more. Ashampoo WinOptimizer 16.00.21 is a shareware program and can be used as a demo to try the software until the free trial period has ended. A full version of the program is available after the trial period ends. For security reasons, you should also check out the Ashampoo WinOptimizer download at LO4D.com which includes virus and malware tests. Additional screenshots of this application download may be available, too.